With the weather slowly starting to warm up, I’ve been starting to crave one food more than others. During the cold, winter months, I want soup. It doesn’t matter that I made soup almost every day that week. When it’s chilly outside, I crave soup. As the weather begins to warm up, I want a salad. Sometimes simply lettuce and homemade dressing are sufficient. But other times, I want something more substantial. That’s when only cobb salad with homemade dressing will fill the void. It’s delicious and filling. Perfect for those times when you are hungry but still want something on the light side. 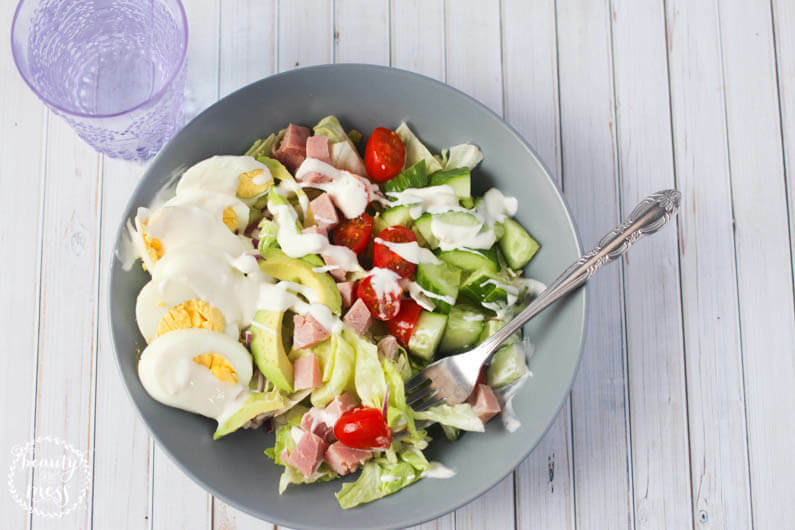 Cobb salad pairs perfectly with soup or can stand alone as the main dish. It depends on how hungry you and your family are that day. I will admit that I typically leave off the tomatoes, but will add them when my husband is home because they are pretty and he likes them. In my book, tomatoes are gross and squishy. Ha! Add a tablespoon of white vinegar to a pot of water and bring to a boil. Boil your eggs (shells on) for 8 minutes and then place in a bowl of cold water for easy peeling. Set aside. Mix the olive oil, vinegar, lemon juice, dijon and garlic in a small bowl. Season with salt and pepper. Set aside. 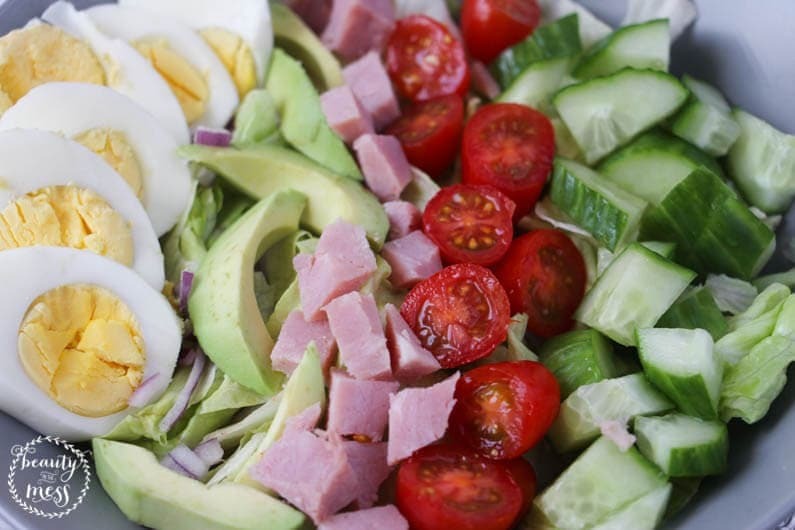 Chop the avocados, ham, tomatoes, cucumber and lettuce. Arrange the vegetables in your bowl and drizzle with salad dressing. 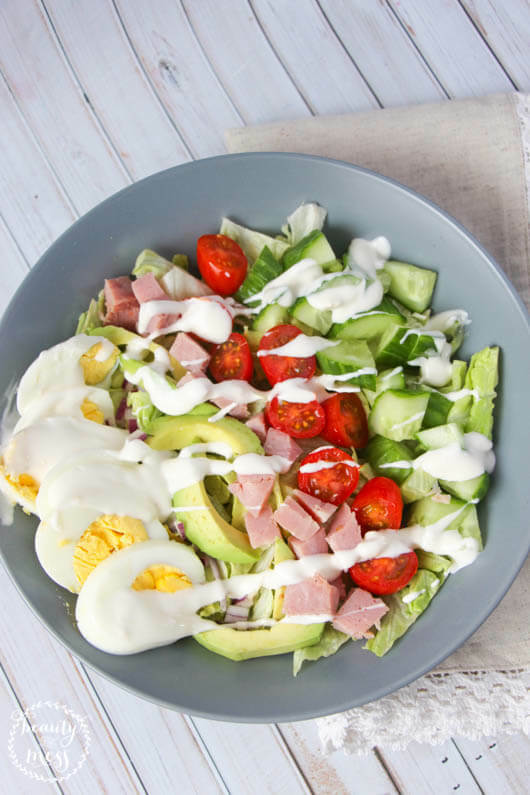 This cobb salad with homemade dressing has just the right combination of ingredients. They meld together so well and taste delicious. 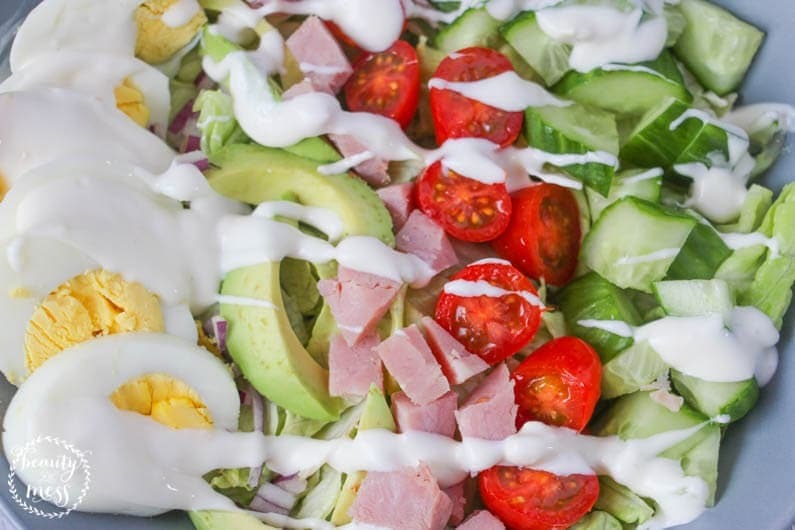 What is your favorite salad during the Summer?